I can't bear to take pictures of the whole tree--it looks so terrible--but my Bing cherry has been hit again. 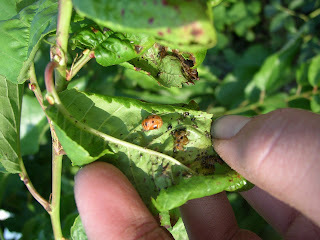 This time, the culprit is aphids. I noticed them a few weeks ago, and also noticed some spiny, red-and-black things firmly attached to the underside of the leaves as well. This site identifies the spiny creatures I saw as the larvae of the Asian lady beatle... and you can see in the picture I took this week that they are looking a lot more beatle-like now! They are apparently good eaters of aphids, but not good enough to save the tree. I had talked about taking it out when I first noticed bacterial canker, and the aphid attack reminded me that it really needs to go. Shovel pruning is usually my method of choice, but this is a big boy so a little hatchet or pruning saw will probably need to be pressed into service. I'm already plotting its replacement--but more on that plan this fall. All of these thoughts about ladybugs reminded me of lady birds... in particular, one Lady Bird, also known as Mrs. Johnson. She's been in the news lately because of illness and hospitalization, but in healthier times she and actress Helen Hayes founded a wildflower center at the University of Texas at Austin. I can totally get lost in the center's website, which can be found at www.wildflower.org. If you haven't already found this yourself, set aside at least half an hour and play around there. 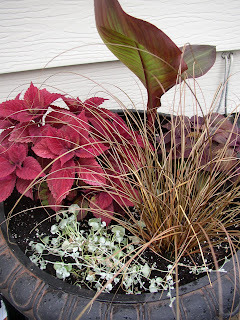 (Or if you're a northern gardener, bookmark it for a nice leisurely perusal this winter when everything outside is brown and grey.) 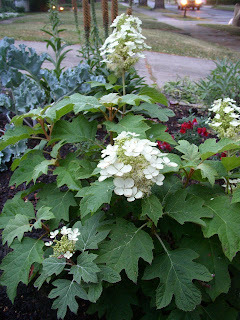 Even if you aren't interested in gardening with natives, you have to admire an image database that can be searched by tags like "bark," "seeds," and other gardener-friendly terms... it's a great resource. If I don't "see" you all, though, between then and now: Have a very safe and fun Fourth of July! 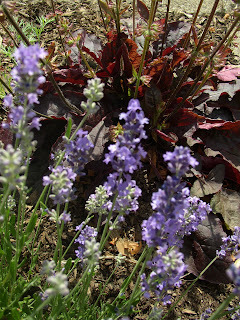 When I started taking the pictures off of my digital camera, I found that one of my attempts at photographing the lavender had instead focused on the purple-leaf salvia behind it. 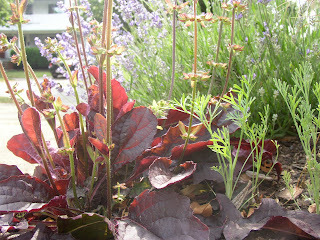 That seems appropriate for my garden thoughts today, don't you think? The other thing that struck me was just how many bees I was seeing. I've noticed a lack of pollinators around these parts lately, so it was nice to see them busily flitting about. 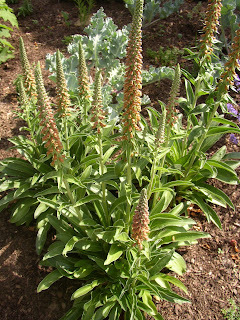 The spanish foxglove, digitalis parviflora, is one of their favorites. 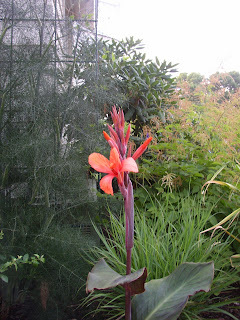 It's one of mine, too: dark green, almost glossy foliage, blooms in more sun or more shade, and with flowers in an unusual chocolatey orange color. 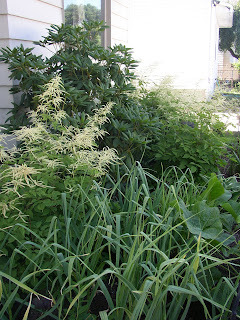 It caused a bit of a stir a few weeks back when I mentioned my family's secret recipe for planting grass. To review: Plant grass seed and apply straw as usual. Then sit around in lawn chairs drinking Corona. They swear that the grass grows so fast this way that you can watch it... but admittedly the more Coronas you drink the more likely you are to see the supposed growth in action. 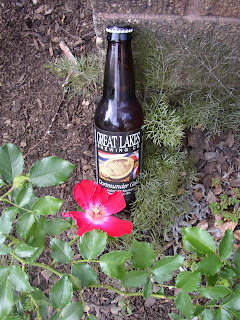 After the planting was complete, I went outside and puttered around that front yard garden with a Great Lakes Dortmunder Gold in hand. I figured it was a fitting way to get this particular rose started... and I was right! More importantly, though, check out that gorgeous foliage. As Barrie noted in a Gardenmob review last year, Dortmund has rosa kordesii in its lineage and thus inherited some good disease resistance. 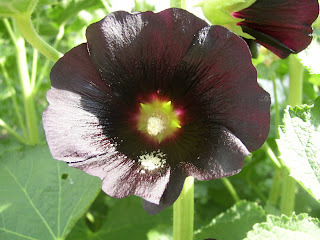 I'm absolutely enamored of its dark green, glossy leaves. 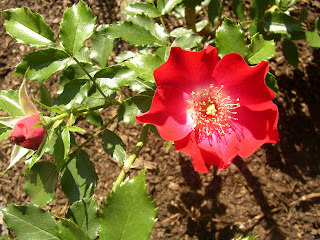 Even if it never blooms again--and even though its thorns are legendary--it's a definitely keeper in my garden! *Edited on Monday to add the picture of a Dortmund bloom in the sun. It glows! In addition to that, I need to mow the grass... but that's not really a fun job for me so I'm not going to include it on my list. 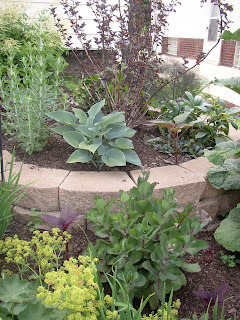 :) Off to get some sleep so I'm up for all of the tasks ahead--I hope that this is a great weekend work-wise for all of my fellow gardeners who have long "to do" lists themselves! This afternoon, the sun emerged after a brief rain so I decided to go out and take a few pictures in the yard. 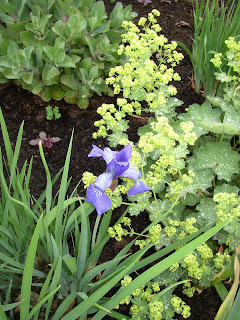 I focused first on the lovely combination of dark blue Siberian iris and acid-green alchemilla mollis, then started to work my way back toward the newly opened peony blooms. While trying to catch some good backlighting on several baptisia, I noticed that a bird had flown by awfully close. It was a blue jay, and it came back for another pass--actually mussing up my hair this time--just as my boyfriend pulled into the driveway. The first near-miss was obviously not a mistake. I hurried back toward an apparently more "neutral" area of the yard as he got out of the car and explained what was going on. "I'm getting dive bombed by a blue jay! Do you see anything back here? A nest, anything?" I asked. Neither of us could pick out anything that looked out of place. "Well, let's see if it happens again. Watch your feet," he cautioned as we cautiously moved toward the back of the lot again. Sure enough, the dive bombing resumed as soon as I got to the end of the baptisia bed. Brian commented that there were actually TWO blue jays diving at me, which explained how they were coming back around so quickly. I was watching my feet as directed when I saw something small and grey plop onto the unmulched ground from the lowest branch of the espaliered pear. "Look, there's a baby!" I didn't want to stress the new parents or the little one out any more than I already had, and I certainly had had enough of their protective campaign... but I couldn't resist taking a minute to snap a photo before I scooted out of there. 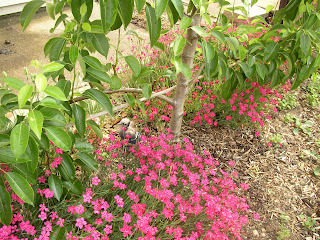 If you click the picture to enlarge it, you can see the baby to the left of the tree trunk, just behind the first clump of dianthus. Speaking of flying, it's past the time we had wanted to get on the road ourselves. We are heading down to OU to see my wonderful sister-in-law graduate from medical school. (Congratulations, Amanda!) It seems to be a weekend of new beginnings all around. 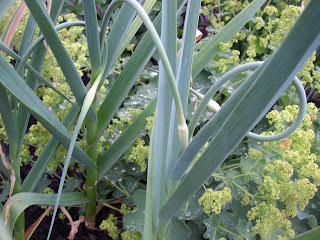 I hope that all of my fellow gardeners make a few fun discoveries out in their own gardens this weekend!